Once more I will comment on a German debate raging in the Economics sections of the national papers. My point is the following. A lot of attention has been drawn to the export sector, which includes automobiles, machines and so on. The export sector is quite large. German GDP in 2007 was 2,423 billion euros, according to the German Statistical Office. Exports have been worth 1,138 billion euros, imports stood at 970 billion euros. Although exports alone are worth almost half the GDP, net exports are hence 168 billion euros, around 6.6 per cent of GDP. That is not much. Productivity growth is important because it is the main determinant of changes in our standard of living. Chart 1 shows the growth rate of GDP per capita along with the growth rate of labor productivity. Note how growth in GDP per capita tends to rise and fall in conjunction with growth in labor productivity. It is as undisputed as it gets among Economists that in the long-run labour productivity matters, not net exports. But newspapers and politicans here are obsessed with Standort-this and Standort-that. Just look at the coverage of the Nokia case and you will know what I mean. Let us take a look at the German numbers of labour productivity, net exports and growth now. In the following graph I use data from Eurostat and the OECD. The different indicators are: gross domestic product (GDP), net exports (NX), unemployment (U) and labour productivity (prod). I put a ‘d’ in front of the short names of the indicators because I use first differences (or growth rates). The graph shows that growth of GDP and labour productivity are correlated – they move in the same way. Growth of net exports however is very volatile and does not seem to influence GDP growth. I also put unemployment growth in the graph, but again there is no correlation to GDP growth. 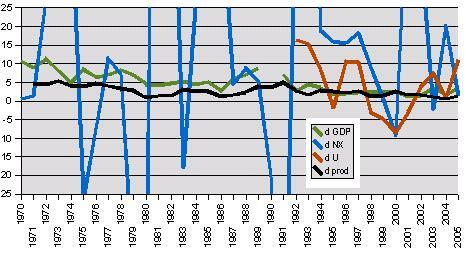 So this graph confirms that in the long-run, it is labour productivity that matters for GDP growth. And GDP growth is regularly used to speak of welfare. So to maximize a nation’s welfare, one needs to maximize labour productivity, not net exports.